SHE'S BEEN TOLD HER birds lend a peaceful feeling to a noisy East Side street corner. Ivy Carter's black-and-white mural at East Fourth Street and Iola Avenue is starkly simple, with geometric motifs taken from Southwest Indian art and birds from her own experience. "I have two birds, a finch and a parakeet, and they kind of worked themselves into it," Carter says. "A couple of people have said they kind of remind them of mourning doves and create a peaceful feeling. That's got to be good for the East Side." 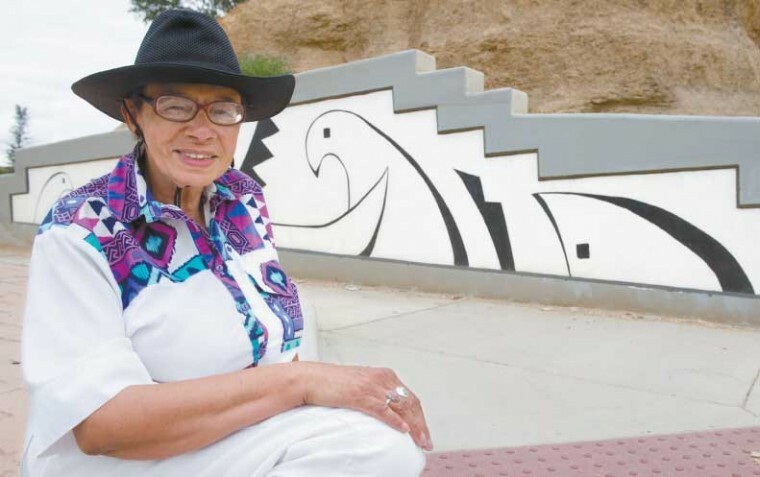 Carter was commissioned by Pueblo's Historic Eastside Neighborhood Association to paint the mural on a stair-stepped concrete wall beneath the earthen bluff on the corner. Her sorority, Alpha Mu Delta, also contributed to the project. Eva Montoya, president of the neighborhood group, says a mural had been discussed for a few months when Carter started attending neighborhood meetings. Carter's church is on the East Side. "I thought, ‘Well, I'll ask Ivy if she won't come up with a draft.’ She worked on it for a while, presented it to the group and it was approved," Montoya says. "We bought her the supplies." Montoya thinks the finished mural is "fabulous." "It's Southwestern, to go with the culture of the neighborhood. I think the birds look like eagles." Montoya says neighborhood residents like it, too. "I go by most every day to be sure it hasn't got graffiti on it. So far, there hasn't been any." Carter says the mural is her first. "I kept it very simple. I studied Southwestern designs, authors and artists to come up with it. I like to work big, so the size wasn't a hardship. I like to do abstract patterns. It's an exciting thing to do, particularly for the East Side." Carter, who is known for her collages but has a painting background, worked early mornings for about two weeks in May. She used exterior acrylic latex paint and finished the mural with an anti-graffiti sealant. The sealant is expensive, she notes, but if the mural is vandalized, the graffiti can be washed off with soap and water. She's gotten positive comments from East Side residents. Carter wants to do more neighborhood murals. "Depending on the size, I'd like to have people work on them with me. Murals traditionally are group projects. Maybe we could involve some of the teenagers from the neighborhood." Montoya says permission has been granted to do a mural in Mitchell Park that would involve children in the public library's Books in the Park program. The size of the wall that's been targeted would allow 20 to 30 children to participate.